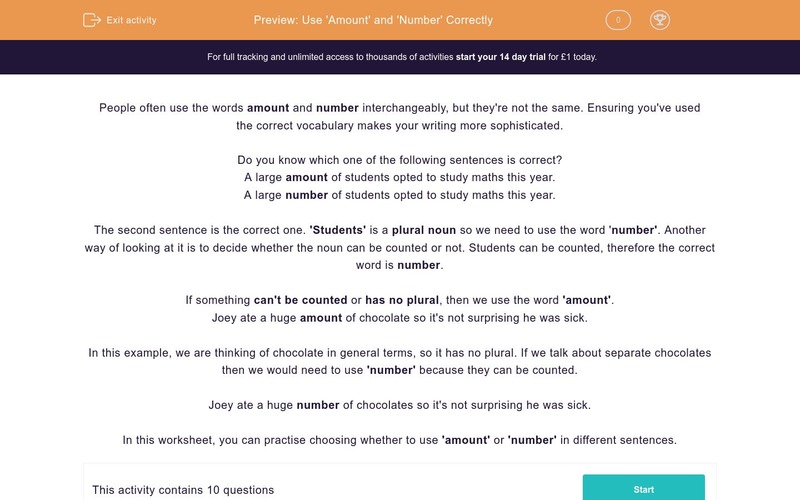 In this worksheet, students practise using 'amount' and 'number' in the correct contexts. People often use the words amount and number interchangeably, but they are not quite the same. Using the correct vocabulary makes your writing more sophisticated. A large amount of students opted to study maths this year. A large number of students opted to study maths this year. The second sentence is the correct one. Students is a plural noun so we need to use the word number. Another way of looking at it is to decide whether the noun can be counted or not. Students can be counted, so the correct word is number. If something can't be counted or has no plural, then we use the word amount. Joey ate a huge amount of chocolate so it's not surprising he was sick. In this example we are thinking of chocolate in general terms, so it has no plural. If we talk about separate chocolates then we would need to use number because they can be counted. Joey ate a huge number of chocolates so it's not surprising he was sick. In this worksheet you can practise choosing whether to use amount or number in different sentences. Peter spent a huge __________ of time on his project. Peter spent a huge __________ of hours on his project. It was a shame that such a small __________ of people turned up. Sarah put a great __________ of effort into her performance. The __________ of children with asthma is increasing. The ship that sank was carrying a large __________ of oil. The ship that sank was carrying a large __________ of containers. The __________ of urban foxes is increasing. Doctors recommend that we should cut the __________ of salt that we eat. I am shocked at the __________ of drivers who still use their mobiles at the wheel. 'Time' is a singular noun. This time the noun (hours) is plural and can be counted. 'Effort' is not a countable noun. This time the correct choice is 'number' because containers can be counted. We think of salt as a quantity rather than as separate grains, so the correct choice is 'amount'.